The New Orleans Saints wanted to honor Navy veteran John Wells at this weekend’s game by giving him an award for his life accomplishments. Wells, who is the executive director of the Military Veterans Advocacy group, declined the award. As always, it’s good to pause here and remember that the NFL player protests have never had a single thing to do with the military. Throughout Mr. Wells’ media appearances today, he has stated he no longer supports NFL football. 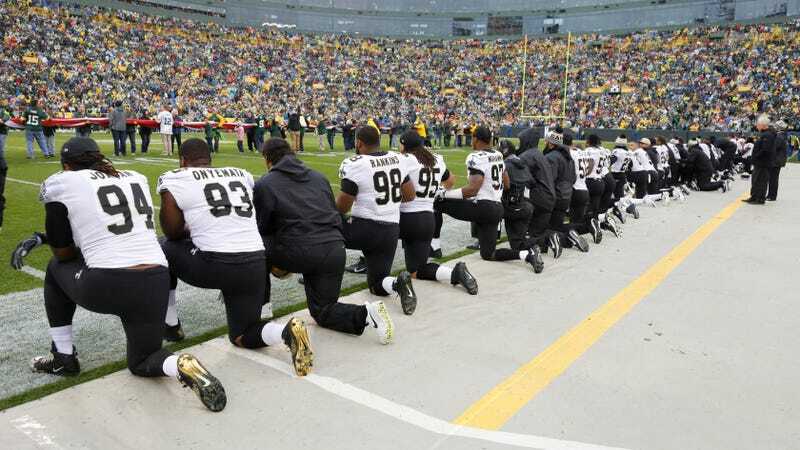 That is unfortunate and disappointing considering the New Orleans Saints’ unwavering 50-plus year commitment to honor, support and recognize our servicemen and women and veterans. We will not allow Mr. Wells’ decision and subsequent media appearances to distract our players and organization from continuing to honor and support our military and veterans. We, as an organization, have decided to move on from this sad and divisive discourse and focus our attention on supporting our military and veterans. In lieu of honoring Mr. Wells, we will use the time allotted for the Peoples Health Champion Award to highlight non-political military advocacy programs and encourage our fans and community to join us in contributing to these groups who directly support our military and veterans. I look forward to Wells’s upcoming appearance on Sean Hannity’s show.